As yet another year of divisive and in ammatory campaigning takes place here in America, it is impossible not to take note of how exceptionally contentious this year’s politics have been. This year’s campaign sheds light on a commonly known, but uncommonly addressed issue in our political system. The United States of America is more accurately described as “the Republican States” and “the Democratic States,” united under their cult-like hatred of one another. It is evident to anyone who watches the news that our United States are split into two sides, but the core issue of this division and the nature of that issue is somewhat obscured. The issue is that Americans have been conned into following a flawed system that divides us into two strict ideological cults. is seems like a bold hyperbole until you critically examine the two parties and how they behave. Let us first identify what is similar about both parties. The Republican and the Democratic Parties each have a set of core beliefs about how the government should be operated and what is right. Both parties take extreme, almost dichotomous positions on issues and denounce anyone who deviates from that position. Some examples of this positioning the parties partake in include their respective stances on abortion, immigration, and taxes. The list goes on to include welfare, the role of religion, healthcare, government regulation, and nearly every other conceivable topic. Finally, both parties systematically demonize and dehumanize the other side to garner support and solidify their hold on their base. If anything ever goes wrong, like the economy for example, it’s always the other party’s fault. Be honest with yourself, now. If you identify as a Democrat or a Republican, can you really say you agree with every one of their mandates? No rational human being adheres so blindly to one side of the aisle. We all agree that the other side has some points, and that each party has its shortcomings and fallacies. This is why not every Republican or Democrat agrees with everything their party does. Some Democrats defend the Second Amendment, and some Republicans support gay marriage. The right way to do things lies in the middle of the two extreme wrong ways to do something. 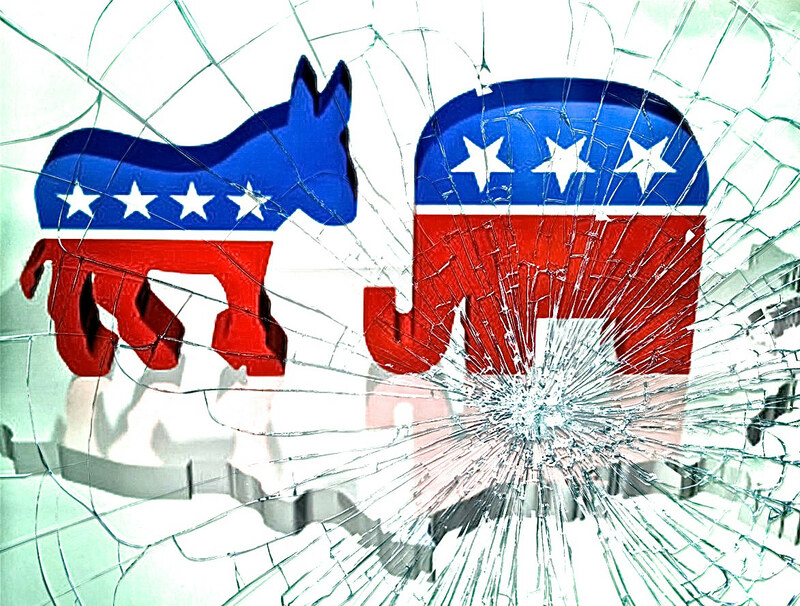 That middle ground is lost more and more as the parties become increasingly divisive. Our flawed system of cults becomes more believable when we lay bare these similarities. Dr Arthur Deikman’s book on cult behavior, “The Wrong Way Home,” outlines four aspects of a group that define it as a cult. The first involves the devaluation of outsiders or non-group members. This promotes them versus us behavior and is obvious in the way the parties talk about one another. Another pertinent theory here is Howard Becker’s labeling theory, which holds that individuals behave in accordance with the labels they are assigned. It also states that society will treat those it labels accordingly. Consider the infamous Stanford Prison Experiment, in which half a class of students were labeled as guards and the other half labeled as prisoners. The guards assumed their roles and treated the prisoners in a way you might expect. This same sort of phenomenon occurs with the parties. By labeling someone whom you disagree with as a Democrat/Republican, you dehumanize them. You reduce them and their criticisms of your positions into a mere collective enemy. This act is one of the most dangerous effects of the Cult Party System, and it plays into Deikman’s second cult descriptor nicely. Cults engage in suppression of disagreement or dissent. The third and fourth characteristics of a cult are the manipulation and control of behavior through use of fear and hope, and the isolation of the cult’s members from outsiders. These two characteristics are employed masterfully by the parties respective media puppets. Fear mongering and suppression of stories that don’t t their narrative are commonplace on Fox News, CNN, and other political news agencies. So what are we to do as Americans? If the parties are cults, and this election year is proving their unsustainability, how can we move forward and change our system? The answer is very simple. We must shake off the cult mentality the parties have shackled us with and engage our fellow Americans in honest, critical discussions as equal human beings. Looking ahead, we must learn to focus on what we have in common with our fellow Americans and learn not to be so easily divided by our differences. Only by focusing on our common desires and values will we be able to once more make true progress.